We are the official UK & Ireland distributor & stockist of CheckMate inline check valves for drainage. CheckMate Valves are cost-effective because they have a long life span and require no maintenance. Consider the Tideflex track record when making TOTEX decisions for your drainage asset management. Click here for a description of CheckMate valve benefits. If you are looking for a price for a particular CheckMate inline valve, fill in our quote request form today. How To Fix A Leaking Flap Valve? Install A CheckMate Valve Instead! What Makes CheckMate® UltraFlex™ Valves Unique? The CheckMate inline check valve's unique elastomer-reinforced design provides a proven record of maintenance-free backflow protection, cost savings and results that no other drainage inline check valve can match. It can be used as both a stormwater check valve and a wastewater check valve. The CheckMate non-return valve has a 100% fabric and elastomer construction that eliminates corrosion problems. Because the CheckMate NRV is made with a unibody construction, there are no mechanical components to catch debris, corrode or fail. The CheckMate non-return valve offers the lowest headloss in the Tideflex range and is verified by in-house and independent testing. The patented CheckMate UltraFlex Inline Check Valve features drastically improved hydraulic and performance characteristics to its predecessor, the original CheckMate Check Valve. Strategically placed reinforcing ribs, segmented pads and the “Arc Notch” bill combine to significantly improve flow efficiency with significantly reduced headloss, while providing absolute backflow protection. These features result in significant savings over the long lifetime of the valve - both in time and overall costs. Contact us to discuss your design. We can provide technical information like drawings & dimensions, headloss charts, specifications and valve weight on request for projects. CheckMate valve installation instructions can be found here. Check out our CheckMate valve installation video here. There are also numerous documents available for download on our site. Find out more about our office CPD presentations or you can book an office CPD here. If you are interested in receiving our newsletter, please subscribe now. How Do CheckMate Valves Work? The CheckMate inline check valve is ideal for use as a stormwater check valve and as a wastewater check valve to prevent flooding in drainage networks. The CheckMate valve is a heavy duty, fabric ply-reinforced, vulcanized elastomer unibody product (larger sizes have integral wire reinforcement in the body as well). This makes it tough and durable, but flexible and easy to install. Its "resting" position is closed with the saddle sealing against the body of the valve and so preventing unwanted entry into the upstream system, whether from backflow, smells, insects or rodents (such as rats). Its operation is silent and holds no risk of harm to people. The CheckMate non-return valve has a very low cracking pressure - upstream flows with as little as 1" (one inch) differential pressure across the valve will break the saddle seal and allow the system to drain. 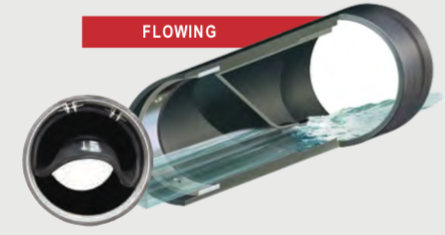 The flat saddle area allows it to snap open under lower pressure than other types of similar valves, and when it closes again its flexible construction will seal around any debris until upstream flow can clear it away. The inline check valve is simply inserted into the pipe end and secured with internal expansion clamps in the end cuff (larger sizes require minimal pinning through the clamps). This makes it quick and easy to install on site and an ideal alternative to traditional push fit non return valves. Flanged valves, thimble inserts and valve arrays are also available. MeasurIT provide a complete advice and design service on these.